Winter is long and bitterly cold in the vast northern part of China. 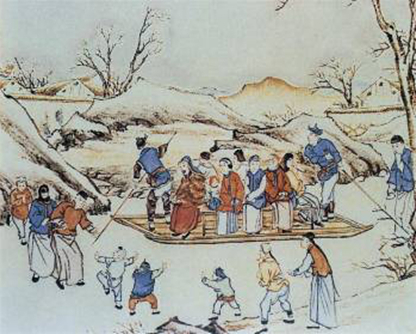 Sports on ice started from the hoary past and prospered during the Ming (1368-1644) and Qing (1611-1911) dynasties, especially among some national minorities, in the form of speed skating ,figure skating ,sledding and archery on ice. 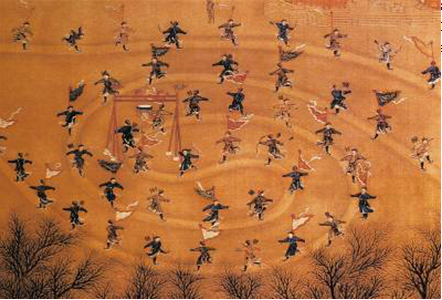 Part of a Qing scroll painting showing figure skaters. Imperial Place Museum. A Qing painting showing a sleigh propelled forward with poles like a pleasure boat on water. Imperial Place Museum.